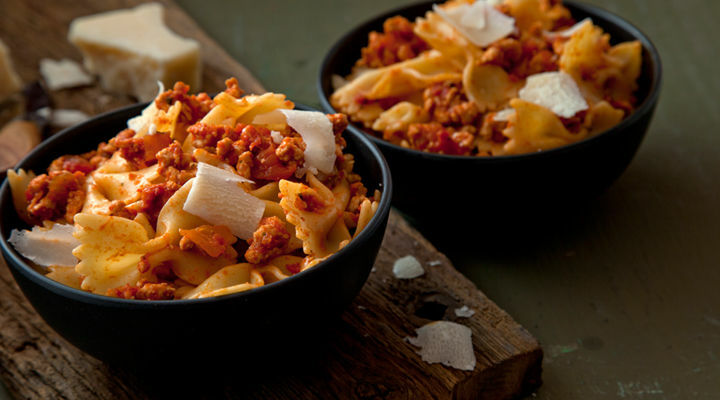 This guilt-free pasta dish is quick and easy to prepare and can be enjoyed by the whole family. Cook the turkey mince in a large frying pan (one big enough to take all the pasta later too) set over a medium heat until it’s well browned. Add the garlic and cook for 1 minute, then add the tinned tomatoes, pasta sauce and dried basil and simmer for about 20 minutes. Meanwhile, bring a large pot of lightly salted water to the boil. Add the pasta and cook for 8 to 10 minutes, until al dente, then drain. Stir the drained pasta into the sauce. Divide between four shallow bowls and sprinkle grated Parmesan liberally on top. Garnish with some fresh basil and serve. Believe it or not, some turkey mince is higher in calories and fat than beef mince, so use beef instead for a lighter option.